Introduction: Mass-gathering music events, such as outdoor music festivals (OMFs), increase the risk of injuries and illnesses among attendees. This increased risk is associated with access to alcohol and other drugs by young people and an environment that places many people in close contact with each other. Aim: The purpose of this report was to demonstrate how Haddon’s matrix was used to examine the factors that contributed to injuries and illnesses that occurred at 26 OMFs using data from the Ranse and Hutton’s minimum data set. Methods: To help understand the kinds of injuries and illnesses experienced, Hutton et al identified previous patterns of patient presentations at 26 OMFs in Australia. To develop effective prevention strategies, the next logical step was to examine the risk factors associated with each illness/injury event. The Haddon matrix allows event practitioners to formulate anticipatory planning for celebratory-type events. Results: What was evident from this work was that the host, the agent, and the physical and social environments contributed to the development of injuries and illness at an event. The physical environment could be controlled, to a certain extent, through event design, safety guidelines, and legislation. However, balancing cultural norms, such as the importance placed on celebratory events, with the social environment is more difficult. Discussion: The use of the Haddon matrix demonstrates that interventions need to be targeted at all stages of the event, particularly both pre-event and during the event. 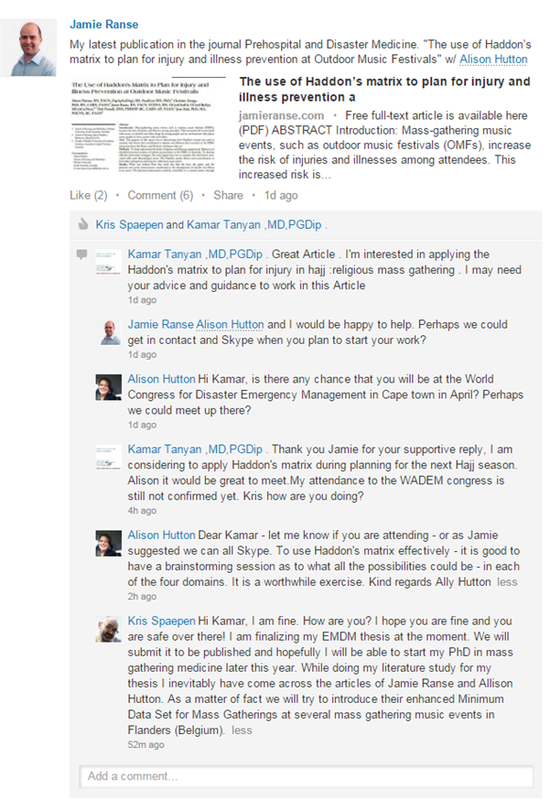 The opportunity to promote health is lost by the time of post event. The matrix provided vital information on what factors may contribute to injury at OMFs; form this information, event planners can strategize possible interventions. The publication of this work has generated international interest in applying the Haddon's matrix to other mass gathering events, such as the Hajj. Hutton A, Savage C, Ranse J, Finnell D, Kub J. (2015). 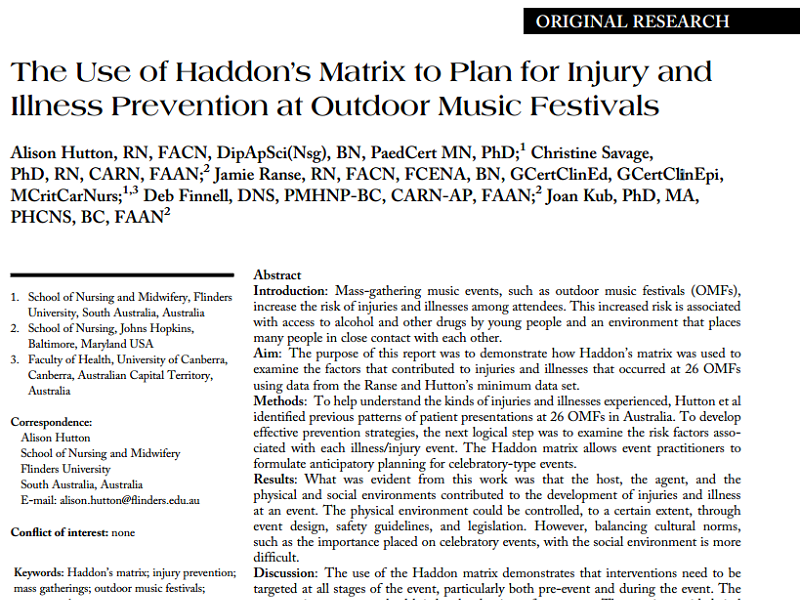 The use of Haddon’s matrix to plan for injury and illness prevention at Outdoor Music Festivals. Prehospital Disaster Medicine.